The Onondaga County Settlement Plan encourages and enables the municipalities of Onondaga County to improve residents’ quality of life through a renewed emphasis on neighborhoods. The Settlement Plan acknowledges that the County’s greatest strength is our tradition of historic neighborhoods, and then focuses on providing the tools that can most effectively reinforce that tradition. 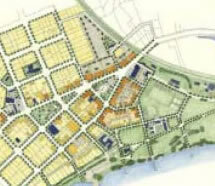 The Settlement Plan represents the determination of the County and its citizens – as demonstrated in the 2010 Development Guide – to limit suburban sprawl in favor of the traditional neighborhood development model of growth. In recognizing that most planning occurs at the local level, the Regional Plan provides a countywide framework within which individual municipalities can make wise decisions. The Regional Plan emphasizes that future growth should be focused at existing urban centers. 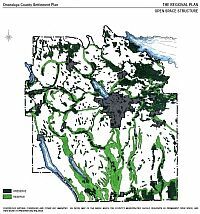 An Open Space Structure outlines the natural areas at the county scale that individual municipalities are asked to incorporate into their Town Settlement Plans. Transportation Policies, which support pedestrian and transit activity, govern the County’s planning of its own transportation infrastructure and which are recommended for use by individual municipalities as well. Encouraging development so long as it is compact, diverse and walkable. Regional planning for environmental protection and open space conservation. Using scale versus use as a basis for zoning decisions. Supporting mixed-uses and a balance between transportation options. Facilitating infill and renovations projects. Zoning within the TND Code is not categorized by uses, but by the Transect, below. The Transect conceptualizes each environment, from rural to suburban to urban, as habitats with a series of characteristics, such as building heights, lot configuration, and block size. The characteristics of each of the six transect categories are detailed within the code, so that each project will reinforce the intended environment rather than have its use dictate its function. The TND Code is a technical document designed to attain specific built results in a regulated legal environment. The TND Guidelines are designed to quickly and easily communicate the philosophy and practice of Traditional Neighborhood Development. As a guideline, it is more descriptive and less precise than the Code, and is best used as an educational tool. Reserves are environmentally significant areas that should be protected. form an Open Space Structure.